When Deligriek opened their doors in Rotterdam I was super excited as this meant that my pita gyros addiction, which I developed during the most recent Spotters meeting in Athens (at least one gyros a day, sometimes even two), can continue to be fed here in Rotterdam! 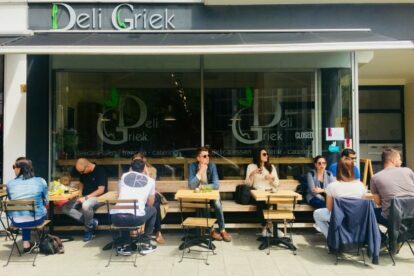 Deligriek is a small restaurant and Greek delicatessen shop which also caters for events. Their specialty (according to me) is obviously the pita gyros, which is served with chicken, pork or a vegetarian version with cheese or grilled vegetables, and you can choose different salad and sauce toppings. The small one is already quite big and just perfect for me, but for extremely large eaters there is also a big size pita. Besides the pita you can also choose from a lot of other Greek dishes, and of course typical Greek drinks like Ouzo and Greek-style ice coffee. During the weekends the small terrace is always full of Greek people, which must be a good sign. During the week make sure you are there on time as the food sells out by the end of the day.